Click here to go to link or read article below. 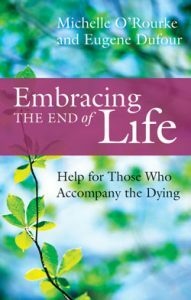 Accompanying the dying and their loved ones is a humbling journey which challenges us to explore the true nature of the caring relationship. We tend to think of health care as providing a service in order to bring about a change or a cure, but the word ‘care’ finds its roots in the Latin word kara, or lament – to grieve, to experience sorrow, to cry out with. From this perspective, care encourages us to meet others in their pain before journeying together towards their healing and wholeness. As a care partner we bring our knowledge and skills as well as our entire psycho/social/spiritual selves into each situation, whether we are conscious of it or not. Our beliefs, our experiences, our own grief/loss history, all play a part in how we interact with others. Professionally, we understand that being at the bedside is not the time for us to do our own inner work of exploring these areas, since our role is to help the patient explore their wishes, values, pain, grief, etc. Yet, to be effective in assisting someone else to explore these questions, we must be self-aware and in touch with our own biases and feelings. Self-awareness is fostered through taking time for quiet reflection and building in regular self-reflective practice. Emerging research has pointed to the positive physical and psychological benefits of mindfulness practices for cancer patients, caregivers and healthcare professionals. (Bauer-Wu). Mindfulness-Based Stress Reduction, (MSBR) initiated at the University of Massachusetts Medical Center by Jon Kabat-Zinn and extensive research done internationally by others in this field has repeatedly shown the positive affects on quality of life and biological outcomes in many different populations. Mindfulness is fostered in disciplines such as meditation and contemplative prayer, as well as regularly coming to quiet. Our society is so fast paced, that we seldom take time to be still. Every living thing needs time for solitude and rest in order to rejuvenate and refresh. Seeds must lie dormant before they bear fruit. This respite, filled with the necessities of nutrition and fertility, is crucial for survival. Coming to quiet for a period of time, where we keep distractions to a minimum and give ourselves time to truly rest and process, is not simply a convenience but a biological, spiritual and psychological necessity. Wisdom traditions have taught that regular solitude and reflection can help us experience more inner peace, less anxiety and an increase in our ability to bring clarity to situations. The Jewish tradition encourages Sabbath – “to set aside a sanctuary in time, disconnect from the frenzy of consumption and accomplishment, and consecrate the day as an offering for healing all beings. There is a Taoist saying: “To the mind that is still, the world surrenders.” Sabbath mind is a mind that can be still, a mind that can rest in delight. 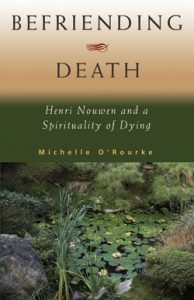 A day of rest, a moment of prayer, a time of meditation, these disrupt the pattern of desperation that infects our thinking, and allow us to be able to see the healing that is already present in the problem.” (Muller, p168). Regular periods of stillness and silence can remind us that much of the healing people will experience at end-of-life comes from our simply being present – without saying or doing anything – a hand held, a shoulder to lean on, or a listening ear. Ongoing self-reflection enhances both personal and professional growth. Our professional organizations understand this and invite us to engage in self-reflective practice in order to identify our strengths and chart our goals and learning needs. Deepening our self-awareness will assist our therapeutic encounters as well as our day to day lives and relationships. What are my character strengths? My professional strengths? What is fulfilling about working in hospice palliative care? What is difficult about working in hospice palliative care? What have I received from others? How has it changed me? Carrying the burdens of others and not addressing stressors by establishing good patterns of self-care can affect functioning and wellness, leading to compassion fatigue and eventually burnout. Boredom, anger, fatigue, loss of enjoyment, low motivation, impaired sleep and self-medicating are some of the indicators for these conditions. Self-care is a moral imperative which many people in caring professions erroneously put at the bottom of their ‘to do’ lists. If we do not take care of ourselves and nourish our body, mind and spirit, we will have nothing to give others, since we cannot give what we do not have. Enjoying relaxing activities such as gardening, music, art, napping! During some recent days of renewal I facilitated with area palliative resource teams, many marveled at what one half hour of silence could do to their mind and spirit. Something as simple as a silent ‘Sabbath Walk’ (Muller, p70) gave them insight into how easy yet profound these practices can be. Exercising mindfulness and building in regular self-reflection and solitude are important steps in fostering self-awareness and self-care, enriching our lives, and enhancing our personal and professional growth. Over 5,000 copies sold worldwide!